It is an instantaneous world out there. We sometimes take it for granted, but it was not always so. When I was growing up I would sometimes buy books by mail order. I would fill out the order form, give my dad cash that I got from my paper route and he would in turn give me a check for the appropriate amount to include with the order. When I worked for B. Dalton bookseller, special orders for customers took six to eight weeks. We would fill out a four-part form using carbonless paper and put the original in the daily U.S. Mail envelope that went to the general office. When the publisher processed the order it was shipped book rate to the store. The world is very different today. The debit card I use to buy groceries at our discount supermarket has that they call card controls. That means that the second my transaction is processed at the checkstand the text message app on my iPhone chimes and alerts me that the transaction has occurred. We’re all familiar with Amazon Prime and how we can get packages in two days, or the next day if we pay an extra $6.99. That can be very useful. The technology is impressive if you stop to think about it. When we were coming up on Terry’s knee replacement surgery I knew that I had a challenge. I had to have the energy to get her the thirty-three miles home from Kaiser Hospital after the surgery, but given my own medical condition and the medication I’m taking I get tired easily. 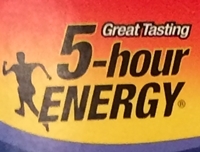 It occurred to me that I would do well to have a bottle of 5-hour Energy in the car. It was Sunday and Terry’s surgery was Tuesday. I was standing on the energy drink aisle of said discount supermarket. They had no 5-hour Energy. I had neither the time nor the inclination to run around town looking for it. I pulled out my iPhone, opened the Amazon app, and did a search on the product. I found a flavor that could be shipped to arrive the next day. I ordered a case. With twelve minutes to spare. It arrived on Monday and I put a bottle in the car. The day Tuesday was much longer than either of us had anticipated. That little bottle packed quite the jolt and saved the day for our drive home in rush hour. It’s an instantaneous world these days.